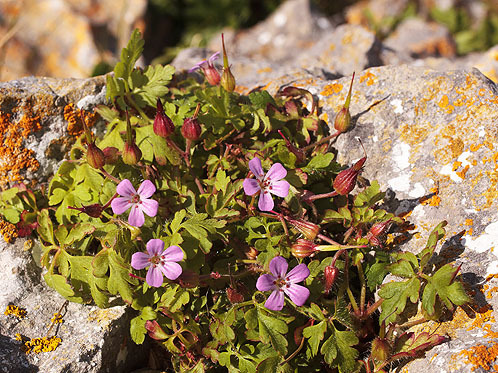 Herb-Robert is a type of crane's-bill that is found in a variety of habitats including woodland, hedgerows, rocky or exposed areas, scree slopes and coastal areas. Herb robert is known by other names such as stinking bob, red robin and robin flower. The name Robert or Robin refers to a household sprite who haunted woodland houses, all flowers named Robin have associations with devils, death and fairies. The small pink flowers of Herb-Robert mainly appear between May and September . On the Cliff Top , Near Mewsford Point.